The Future (of CMK) is Now! Hard fun at CMK 2016! 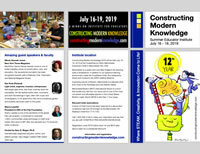 Constructing Modern Knowledge, celebrates its 10th anniversary this July 11-14, and represents the best work of my life. Before anyone was discussing the maker movement in schools, Constructing Modern Knowledge created a four-day oasis where educators could learn-by-doing through the construction of personally meaningful projects with digital and traditional materials. From the start, CMK was never a conference. It was an institute. From its inception, CMK was designed to build a bridge between the best principles of progressive education and the constructive tools of modernity. Since our focus was the Piagetian ideal that knowledge results from experience, educators attending Constructing Modern Knowledge, when not lost in project development, engage in formal and informal conversations with some of the greatest innovators and thinkers of our age. Dont’ miss out! Register today! CMK Speakers are not recruited for being cute or witty, but because they were experts with a body of profound work. CMK began with guest speakers Alfie Kohn, Peter Reynolds, and digital STEM pioneer Robert Tinker. Until his death, Marvin Minsky, arguably one of the most important scientists of the past century, led eight annual fireside chats with educators at CMK. The great mathematician, scientist, and software developer Stephen Wolfram “subbed” for Professor Minsky last year. Two of the greatest jazz musicians in history led a masterclass at CMK. Years before his daily Blog changed the media landscape and he was featured in a commercial at the start of the Academy Awards, Casey Neistat was a guest speaker at CMK 2012. Civil rights icon Jonathan Kozol spent time at CMK. Alfie Kohn and Deborah Meier engaged in a spirited conversation, as did Eleanor Duckworth and Deborah Meier. Best-selling historian James Loewen spoke at CMK nearly a decade before Southern States began dismantling confederate statues. Wonder Kid and CMK 2015 speaker, Cam Perron, is about to be honored for his extraordinary contributions to baseball. MIT Media Lab faculty have generously hosted us for eight years. Check out the list of the other amazing people who have spoken at CMK. YouTube filmmaker and media sensation Casey Neistat spoke at CMK 2012! One of the great joys of my life has been sharing my heroes and friends with educators. Our faculty consists of brilliant women and men who invented the technology that justified computers in classrooms. Cynthia Solomon, the last surviving member of the three people responsible for inventing the Logo programming language for kids has been with us since the beginning. Everything I know about teaching teachers I learned from Dan and Molly Watt, who abandon retirement each summer to help educators reflect upon their CMK learning adventures. Brian Silverman has had a hand in every strain of Logo, Scratch, and LEGO robotics sets for the past forty years joins us each summer. The Aussies who invented 1:1 computing have been on our faculty as have the co-inventor of the MaKey MaKey and Super-Awesome Sylvia. Sadly, we recently lost the remarkable Edith Ackermann, an elegant and profound learning theorist who worked with Piaget, Papert, and Von Glasserfeld. Edith was part of CMK for three years and touched the hearts, minds, and souls of countless educators. CMK introduced the profound work of Reggio Emilia to a new community through the participation of Lella Gandini, Lillian Katz, and the magnificent Carla Rinaldi. Nothing moves me more deeply than the stories of how CMK participants had coffee or went for a walk with a genius they only had access to because of our institute. CMK welcomes educators of all ability levels, from newbies to tech-savvy power users, but everyone learns together from and with each other. Annually, teachers at CMK create amazing projects that might have earned them a TED talk two years or engineering Ph.D. five years ago. For example, educators at CMK 2016 created their own version of Pokemon Go a mere week after the actual software was released to great media fanfare. It is possible to create rich productive contexts for learning without fancy architecture, bells, furniture, curriculum, tests…. 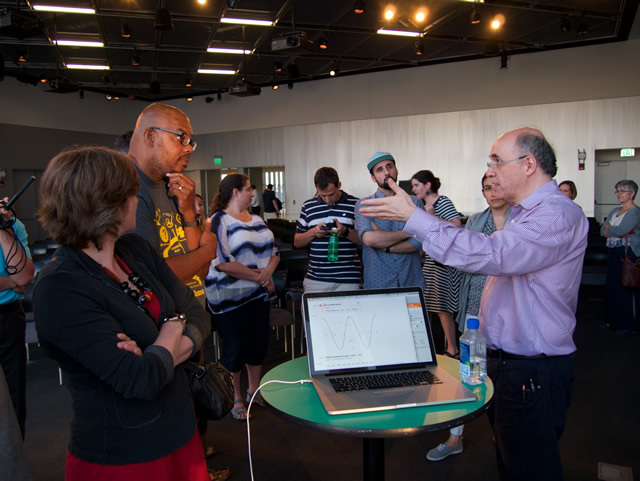 Where else, but CMK, can educators interact with one of the world’s most prominent scientists (in this case, Dr. Stephen Wolfram)? Although a labor of love, Constructing Modern Knowledge is a hell of a lot of work and relies on the generosity of countless colleagues. I created CMK when no other institution or organization would do so and have run ten institutes with zero funding, grants, sponsors, or vendors. I packed up the first CMK and caught a plane two hours after the 2008 institute ended. Last year, eight of us spent two and a half days packing up the 60 or so cases of books, tools, materials, and technology we ship across the USA before and after each institute. Our hearts swell with pride from how CMK alumni are leading schools and professional learning events all over the world. Through their efforts, the impact of Constructing Modern Knowledge will be felt by children for decades to come. If you have read this far, I hope you will understand that 2017 may be the last Constructing Modern Knowledge. Please consider joining us. Since CMK believes that anything a learner needs should be within reach, we build a library. Whether or not the Constructing Modern Knowledge summer institute ends in 2017, we will continue to offer innovative learning adventures for educators around the world. Check out the CMK Futures web site to learn about bringing our expertise to your school, community, corporation, or conference.